Isabel Cole is the recipient of a 2013 PEN/Heim Translation Fund grant for her translation of Franz Fühmann’s At the Burning Abyss. Read an excerpt of her translation here. Immersed in post-Wall East German culture in my first Berlin years, and increasingly interested in the quirky, cryptic, and apocalyptic manifestations of un- and semiofficial East German literature, I had heard of Franz Fühmann (1922-1984) long before I read him. 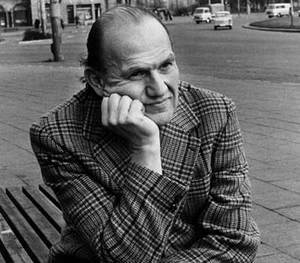 Once a high-ranking member of the GDR’s literary nomenklatura, his radical disillusionment in “actually-existing socialism” made him a mentor for a whole generation of dissident writers in the 1970s and ’80s. So I began reading him out of a certain sense of duty—and couldn’t stop. With his immediacy, his keenly argumentative mind, and his voracious interests, he was one of those writers I at once felt to be a friend: an endless source of provocation and comfort. Fühmann had an often-quixotic passion for dialogue—whether with socialist censors, West German leftists, or schoolchildren—and a genius for connecting with people on the most sophisticated yet human level possible. Of all the fascinating writers of the former GDR, it is Fühmann, with his outsized personality, not to mention his exquisite language, who still speaks to us with the most immediacy. Fühmann’s oeuvre spans everything from children’s books to essays, screenplays, dream and travel diaries and story cycles. Sadly, this very wealth of forms—and the lack of a “classic novel”—is one reason for his neglect: he is hard to pigeonhole. And it is hard to know where to start. Given the opportunity to translate Fühmann, I chose to begin with his 1962 story cycle, The Jew Car (Seagull Books, 2013). With its autobiographical elements and eloquent, gripping storytelling, it is an ideal introduction to Fühmann and his work. In The Jew Car, Fühmann sought to fit the radical transformations of his youth—from fervent Catholic to fanatical Nazi to ardent Communist—into one neat narrative arc. Later, Fühmann was dissatisfied with its positive conclusion: his socialist conversion at a Soviet P.O.W. camp. Yet this “happy end” is like a hastily-built dam, unable to contain the stories’ dynamic of disillusionment; one senses that socialism will be swept away next. Twenty years later, and two years before Fühmann’s death, this process would culminate in At the Burning Abyss. I came to this book knowing only that it was about the Expressionist poet Georg Trakl (1887 – 1914), legendary for his troubled life and the linguistic brilliance and enigmatic imagery of his slender oeuvre. Little-known in the English-speaking world, famously “untranslatable”, he had long exerted an abyss-like fascination on me. To have Fühmann as a guide seemed a stroke of luck. But as the first few pages made clear, this was far more than a poetical analysis, or even a personal reading. What was originally intended as a brief afterword for the first East German edition of Trakl’s poems in the 1970s had taken on a life of its own, sprawling into a poetopolitical(auto)biographical essay that flouted page limits and political taboos. At the Burning Abyss begins by revisiting a scene described in The Jew Car, this time revealing a detail Fühmann omitted in 1962: the uncanny intersection between his life and Trakl’s. Fühmann had discovered Trakl’s apocalyptic poems as a soldier, and they shook his faith in Nazism. On furlough at the very end of the war, Fühmann learned that his father had known Trakl in World War I; this last conversation with his father, who died soon after, would haunt him for the rest of his life. Fühmann was taken prisoner by the Red Army and began the process of reeducation toward socialism. At the Burning Abyss revisits this socialist conversion as well; now Fühmann dissects the techniques of the propagandist and his own emotional response, one which long blinded him to the problems of the socialist regime. This new black-and-white world view—he explicitly draws a parallel to Nazi ideology—suppressed dissonant voices. Trakl, who had first opened Fühmann’s eyes, was taboo in the GDR; for decades, the “decadent, bourgeois, reactionary” poet remained Fühmann’s guilty pleasure. In At the Burning Abyss, Fühmann describes his quest to uphold socialism’s humanist ideals while identifying an alternative to right- and left-wing ideologies—ultimately finding this “third way” through Trakl’s life and work. Delving into Trakl’s poetics, he works out a theory of poetic versus political language, and with great sensitivity explores Trakl’s “unlivable life”. This illuminating introduction to Trakl and his oeuvre, incorporating valuable first-hand accounts and raising sharp questions about biographical taboos, unfolds in constant dialogue with Fühmann’s own reflections and responses. Confronting Trakl’s demons, Fühmann gains an understanding of humanity that embraces its dark sides and bitter truths, in radical contradiction to the panaceas of ideology. Today, At the Burning Abyss has lost none of its compelling urgency: as an introduction to one of the 20th century’s great poets, and as a confrontation with the great questions of the 20th century itself. It is literary criticism as personal and historical drama, and a formal tour de force, inventive and complex, that expands the boundaries of the essay.